Public health is essential in all communities. It is involved in protecting the overall health of entire populations. It is concerned with education, prevention of diseases, promotion of health, and providing basic services. Public health facilities like rural health clinics serve as primary healthcare provider in the Philippines. These are situated at the heart of local communities to provide basic and free immediate care. Local health professionals tend to basic and minor cases. Major health cases are immediately referred to nearby hospitals. With limited budget and supplies, too often health professionals have to deal with these issues as they try to address the needs of their patients. Continuous education is a big factor in raising the population’s awareness on health issues. Doctors, nurses, and midwives implement house and village visitation and education as a means to better relay the programs and services provided by the rural health clinic. The general population’s health can also be determined by nutrition. 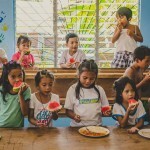 In many local communities in the Philippines, people have low awareness of nutrition. Too often they take for granted the importance of proper nutrition. Poor nutrition results to poor health. VFV’s public health program is put in place to help address issues facing nutrition and health. Volunteers have the opportunity help promote proper nutrition and health by working at rural health clinics and nutrition projects.